From Harry at Sharkhunters and thanks to WIZARD! How the mighty have fallen. Once the bulwark of NATO defense now rather enfeebled so it seems. The Bundeswehr combat capability severely degraded. "The Bundeswehr, has access to less than 50 percent of many major weapons systems. Many primary weapons systems in the Bundeswehr are not available for training exercises or deployment. Number of weapon systems ready for action"
My thought was always the Bundeswehr was the ground component of the German military forces. But this is not so. 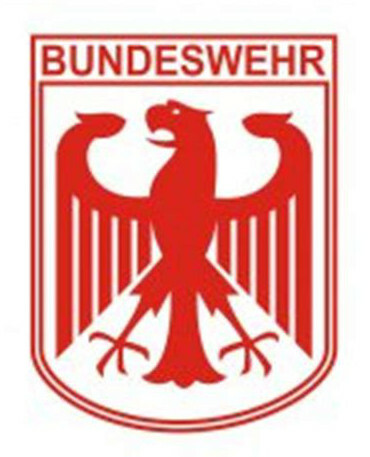 Bundeswehr the combined and united German military, army, navy, air force and ancillary organizations. 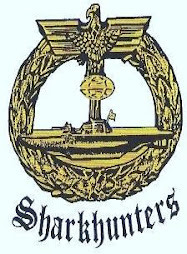 Six of those seven items as listed pertaining to the German Air Force [Luftwaffe]. That status of the German submarine contingent already the topic of a prior blog entry. Military intelligence is an oxymoron? This is so? "oxymoron - - n. A rhetorical figure in which incongruous or contradictory terms are combined"
Here with the perspective of the retired Israeli intelligence officer Yaakov Amidror regarding the counter-insurgency [COIN] problem. 1. Having a sanctuary to operate from. 2. Having the support of an outside power. 3. Having the support of the people. NOW to the musings of General Amidror thanks to the Internet web site JCPA. "Winning Counterinsurgency War: The Israeli Experience"
* The decision of the political echelon to defeat terrorism and to bear the political cost of an offensives. * "Control of the territory from which the terrorists operate." * "Isolating the territory within which counter-terrorist operations are taking plane." * "Multi-dimensional cooperation between intelligence and operations." * "Separating the civilian population that no connection with terrorism from the terrorist entities." Insurrections generally speaking a response to poor governance! INSURRECTION AS PERCEIVED BY THE EXPERTS IN MOST INSTANCES THOUGHT TO BE A PROBLEM THE NATURE OF WHICH IS 80 % POLITICAL! BUT THERE IS A MILITARY SOLUTION IF THE SITUATION PROPERLY ANALYZED AND APPROACHED CORRECT. So says Yaakov. And when Yaakov speaks, we should all listen? Yet one instance of Boko Haram mischievous mischief. Kidnapping of young women and girls. Fate unknown and very uncertain. 1. "Nigerian army rescues most of girls from another terrorist kidnapping"
"Parents and a government official said Thursday that 76 girls had been rescued and at least 13 were still missing from a new Boko Haram kidnapping attack in the southern Nigerian town of Dapchi. Two girls were found dead. The attack came four years after the Islamist terrorists' tragic abduction of 270 girls from a school in Chibok." 2. "In Nigeria, Another Mass Kidnapping Stirs Painful Memories and Anger"
"DAPCHI, Nigeria — A militant raid on an all-girls’ school. Dozens of missing students. Silence from government officials. Reports of rescues that turned out to be heartbreakingly false." MOST OF THOSE YOUNG WOMEN AS KIDNAPPED FOUR YEARS AGO STILL UNACCOUNTED FOR. BOKO PLAYS DIRTY! NOW DAPCHI. First the Maldives and now the Seychelles? Some damn fool thing in the Seychelles? Who would have ever thought it? Thanks in both instances to the tip from Jeff. As is germane to the previous blog entry the topic of which was a potential Indian-Chinese show-down over the Maldive Islands. 1. "India To Build Major Overseas Military Base Off Africa To Combat China"
India is preparing to construct a significant overseas military base on an island in Seychelles, an archipelago of 115 islands in the Indian Ocean, off East Africa to counter growing Chinese influence in the Indian Ocean. Last month, Seychelles and India signed a twenty-year agreement, permitting the Indian military to build an airbase and naval installations on Assumption Island, a small island in the Outer Islands of Seychelles north of Madagascar, said Seychelles News Agency. 2. "‘China deploys warships to East Indian Ocean’ amid rivalry with India"
A Chinese news portal says 11 Chinese warships have entered the East Indian Ocean this month, in what seems to have been a show of strength amid a rivalry in the region with India and a crisis in the Maldives. Think String of Pearls Strategy and counter String of Pearls Strategy. Russian commitment to the continued rule of the the Syrian despot Assad now can be seen as long-term and without question so? 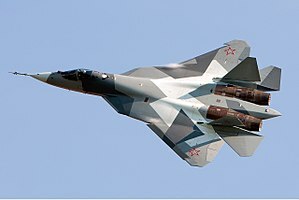 "Russia's topline Su-57 deployed to Syria to challenge US, Israeli air might"
"This top-performance fleet raises Russia’s air strike and defense capabilities in Syria to the highest standards of any air force in the world, with enough power to take on US and Israeli air might in the Syrian arena. The Su-57's weapon bays are designed to carry Russia’s new nuclear tactical X-50 air-launched cruise missile, although it is not known whether the aircraft in Syria are carrying them." "DEBKA . . . military sources see President Vladimir Putin's decision to send the Su-57 fighters to Syria as substantially raising the big power stakes in Syria"
Beware this situation. Things can spiral out of control and in the proverbial heartbeat. Beware! PRO-ASSAD MILITARY FORCES JOIN FORCES WITH ANTI-ASSAD ELEMENTS CURRENTLY UNDER ATTACK BY THE TURK IN AFRIN? 1. 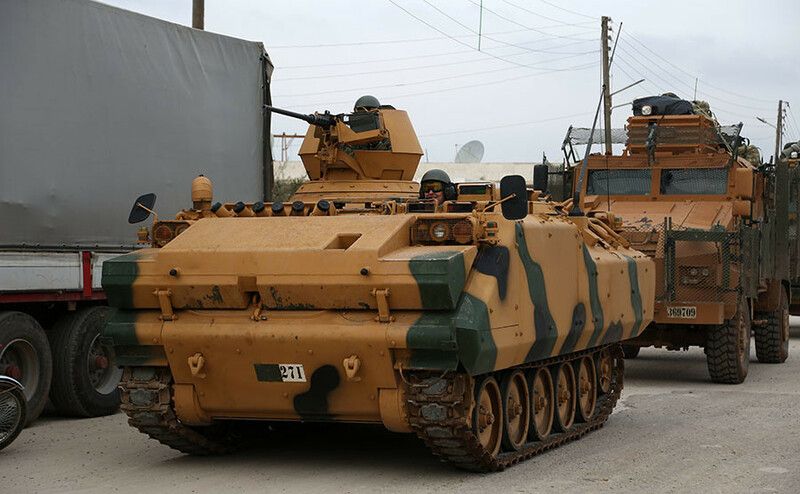 "Turkey warns Damascus not to send troops to Afrin"
"Turkey warned on Monday it would confront Syrian government forces if they entered Syria's northwestern Afrin region to help the Kurdish YPG militia repel a Turkish offensive. President Vladimr Putin has meanwhile called on his partners in the Syrian conflict, Turkey and Iran, to hold a summit next month to try and sort out the jumbled scenario developing among his allies." 2. "Pro-Syrian force heads for Afrin town. 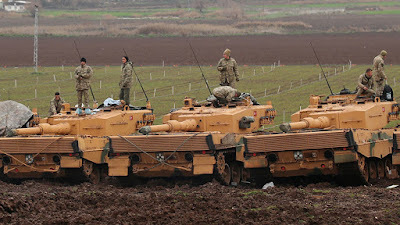 Turkish air force bombs their route"
"DEBKAfile's exclusive sources: The Popular Forces, which are allied with the Assad regime, set out Tuesday for Afrin City with tank support. This group is made up of Afghan Shiites and the Syrian Alawite Shabiha. 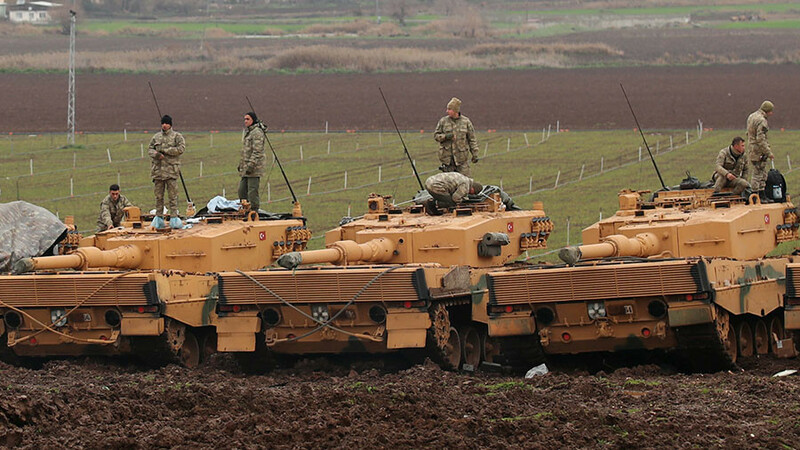 No sooner had this force entered the Afrin enclave when Turkish warplanes took to the air to bomb their route to the city"
3. "Rising Turkish-Syrian tension over Afrin amid exchange of fire"
"Turkey Wednesday warned Damascus that pro-Assad forces would face serious consequences for entering the north Syrian Afrin enclave to help Kurdish fighters repel a Turkish offensive. Turkey and its rebel allies claimed to have forced the pro-Assad back, maintaining that a 40-50 vehicle convoy had retreated under artillery fire. But a YPG official and a pro-Assad military commander denied this and said they had returned the fire"
THE DEVOTED READER TO THE BLOG UNDERSTANDS [?] THE WAR IN SYRIA PERHAPS THE MOST COMPLICATED AND CONVOLUTED IN THE FIVE-THOUSAND YEAR HISTORY OF WARFARE. Thanks to tip from D.C. at Jungle Trader. "Uncovering the impact of Salinger's World War II experience"
"Before J.D. Salinger became famous for his 1951 novel "The Catcher in the Rye" and infamous as a literary recluse, he was a soldier in World War II. While serving in the U.S. Army's Counter Intelligence Corps (CIC) in Europe, Salinger wrote more than twenty short stories and returned home with a German war bride." 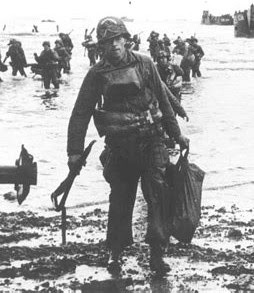 This image might actually be of J. D. Salinger wading ashore at Utah Beach, 6 June 1944! Carrying M1 carbine with his right hand and typewriter in bag with the other hand. Can a devoted reader to the blog or anyone else for that matter either confirm or deny with any degree of veracity this is Salinger? J. D. as counter-intelligence not a combat arms soldier per se. His mission primarily I might think to unmask collaborators spying for the German and stay-behind operatives. American troops during the Normandy Invasion told to not be too friendly with the French, the fear being sabotage and espionage by French fascists on behalf of the German. J. D. too during post-war his counter-intelligence mission continuing during the occupation of Germany, rooting out Nazi die-hard elements as still active. J. D. as a result of his military experiences perhaps suffering from today is diagnosed as PTSD? "Syrian air defenses spread out to target US as well as Israeli overflights"
"US military officials are cited . . . as estimating on Thursday that the combined Russian, Syrian, Iranian and Hizballah army massing on the western bank of the Euphrates in the Deir ez-Zour region will go for one of the oil or gas fields held by the US-backed SDF (Syria Democratic Forces), which is composed mainly of Kurdish YPG militiamen. Their particular targets are the CONICO gas facility and the al-Omar oil fields." 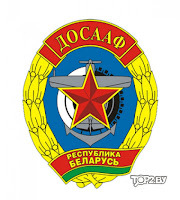 AIR DEFENSE NETWORK AS UNDER THE CONTROL OF THE RUSSIAN? WITH ALL THAT MIGHT MEAN FOR FUTURE COMBAT IN THE SYRIAN THEATER OF OPERATIONS.. Body count always difficult to determine. Was it two hundred Russians killed or was it two-hundred killed include among them Russians. "Up to 200 Russian advisers killed in last week's clash with US forces in Syria"
"In the first military clash between US and Russian forces in Syria, US sources reported on Tuesday, Feb. 13, that at least 100 Russian 'mercenaries' were killed and more than 200 injured. The death toll has doubled since the clash on Feb. 8, in which the US military attacked Russian engineers laying a floating bridge on the River Euphrates near Deir ez-Zour as well as the Syrian and allied pro-Iranian forces attempting a crossing to the east bank." WAGNER GROUP! RUSSIAN MERCENARIES! ONCE AFFILIATED WITH AMERICAN BLACKWATER! Merely securing a river crossing across the Euphrates with a secure land-bridge between Iran and Syria just an interim step? Those foreign interventionists and proxy forces as allied with the despot Assad have future goals in mind? DEBKAfile even giving us a time-line as to how events transpire? "The next Iranian-Israeli engagement in Syria is due in late April, early May"
"Iran's next challenge to Israel is likely to be more extensive than a lone Iranian drone intrusion and may start at a distance from Israel's northern border. Russia and Iran are trying to run a two-way, cross-border military movement between Iraq and Syria, which US forces in Syria have so far frustrated . . . military sources report that the United States is in the process of establishing a new 'Border Security Force' in Syria, which is composed mainly of Kurdish fighters. Iran and Russia are meanwhile training an elite 'rapid deployment force' of 5,000 Shiite fighters for combat in Syria." SYRIAN/RUSSIAN/IRANIAN/IRAQI/HEZBOLLAH COLLUSION THE BORDER CROSSING WITH THE BRIDGE ACROSS THE EUPHRATES VITAL TO ESTABLISHING A WORKING AND LONG-TERM LAND BRIDGE BETWEEN IRAN AND SYRIA!! Labels: Iran, Iraq, Israel, Syria. Continuing those blog entries the role of foreign interventionists and proxies in the Syrian Civil War much more pronounced. Iranian drone as intruding into Israeli airspace described as a knock-off of an American RQ-170. Once more thanks to DEBKAfile. "The Iranian Saegheh drone in Syria - a worry for US as well as Israel"
"Iran's Saegheh, which infiltrated Israeli air space on Feb. 10, is no ordinary UAV; it is the Iranian Revolutionary Guards' prize armed drone for assault and intelligence gathering. It was also discovered to have been part of a fleet of advanced armed Saegheh UAVs housed at the T-4 base. The second wave of Israeli air strikes against 12 Syrian and Iranian targets decimated this fleet. Most importantly, the drone intrusion and its sequel exposed the intrusion to have been part of an Iranian plot against Israel in coordination with the Russian air force Syria, which shares the T-4, and with the Russian-controlled Syrian air defense systems." Russian air force [VVS] and the Iranian drone operators sharing the same facility? An Israeli attack on Iranian drones [as was now and in the future] also imperils Russian military personnel? Here begins a series of blog entries the topic of which is the Syria Civil War and how it has become to a much greater degree a war of foreign interventionists and proxies versus other foreign interventionist and proxies. At various levels. "Russian troops were involved in Iranian-Syrian clash with Israel"
"The Syrian anti-air missiles which hit an Israeli F-16 early Saturday, Feb. 10, are part of a system operated with and commanded by the Russians from their Kheimim air base. The F-16 was shot down during an Israeli air strike against the Iranian mobile drone command vehicle at the T-4 air base near Palmyra, which launched a UAV into Israeli airspace that morning . . . The second much broader wave of Israeli air strikes against Syrian and Iranian targets later Saturday morning was also attacked by air defense missiles which were fired from Lebanon as well." SYRIAN AIR DEFENSE [AD] NOW MORE CORRECTLY UNDERSTAND AS RUSSIAN AIR DEFENSE? NOW you can know the rest of the story. The Soviet experience in Afghanistan. With a perspective from a top Soviet commander, Boris Gromov. Thanks to the Russian media outlet Sputnik that article by Tony Devon. "Top Russian Commander Debunks Myths About Soviet War in Afghanistan"
Myth II: "The Soviet Union Lost the War in Afghanistan"
Myth III: "Violence, Violence, Nothing But Violence"
Myth IV: "Americans Do It Better"
Insider perspective decades later helpful? Devoted follower to the blog go read! SOVIET BATTLEFIELD CASUALTIES ABOUT TWENTY-THOUSAND [5,000 KIA, 15,000 WIA] SOVIET NON-BATTLEFIELD CASUALTIES A WHOPPING THREE-HUNDRED THOUSAND OR SO. I MIGHT THINK FROM HEPATITIS, BAD WATER AND FILTHY CONDITIONS!! Came across this quite by accident. As presented for your edification. * Move From Thought to Action. "Thought indeed was required, but the meaning was action." "A command is likely to be what its commander is." A team reflects its leadership in all respects, from the top down. "We were handled in piecemeal, on toasting forks." Don't hold back...apply full effort and complete the job. efforts, then send them to work. 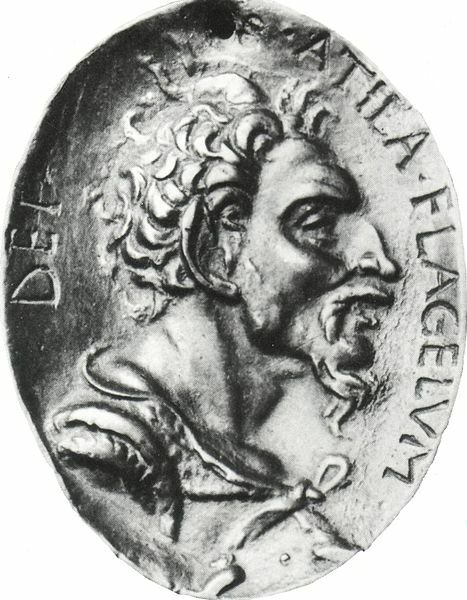 "Great crisis in human affairs calls out the great in men." Identify and mentor your talent; seed quality in your organization. "In great deeds something abides. On great fields something stays. Give subordinates the opportunity to excel, and recognize their value." See also for free: Full text of "Leadership Secrets of Attila the Hun PDF Book"
Testimonials to the text quite profound!! Leadership secrets as are germane to the military and civilian both? Can this be possible. The military is normally concerned only with killing people and breaking things. Leading people however, those techniques and methods that guarantee success universal however? You the devoted reader to the blog must decide for yourself. As it was in 2016! Codd Royal Navy [RN] commanding. From MARCONI thanks to Harry at Sharkhunters. 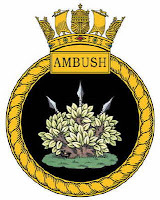 "The charge relates to an incident in which the submarine HMS Ambush, which was on a training exercise, suffered damage to its conning tower when it was involved in the collision off the coast of Gibraltar on July 20 2016. Following the incident, the Ministry of Defence [MoD] released a statement saying"
[Codd] . . . "'took his eye off the ball', leading his nuclear submarine to collide with a tanker, a court martial has heard. 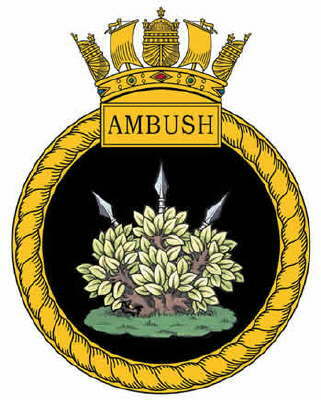 Commander Justin Codd, 45, of UK Maritime Battle Staff, was sentenced to forfeiting a year of seniority after pleading guilty at Portsmouth Naval Base to negligently hazarding the £1.1 billion submarine HMS Ambush." CODD NOW TO BE IN CHARGE OF TRAINING NEW NUCLEAR SUBMARINE COMMANDERS? GOOD LUCK WITH THAT! "We have found something!" How many times now? The very unusual and unexpected presence of atomic particles in the atmosphere the origin of which has not been identified! Particles as associated with nuclear weapons or the residue from atomic testing! "Mysterious Radioactive Substance Reportedly Detected in Alaska"
"Scientists from the US National Oceanic and Atmospheric Administration [NOAA] have discovered what they claim is an atmospheric aerosol particle enriched with the uranium which is used in nuclear fuel and bombs." "A 'highly unusual aerosol particle containing a very small amount of enriched uranium' was tracked at an altitude of seven kilometers above Alaska's Aleutian Islands"
"The scientists underscored that the particle with the enriched uranium-235 was spotted for the first time in twenty years of observations. The uranium-235 is specifically used for making nuclear fuel and bombs." URANIUM U-235 AS ENRICHED BUT WHAT EXTENT! U-235 OF 95% PURE NEEDED TO BUILD A GUN-TYPE ATOMIC BOMB. And the source of this radiation is exactly who? A cause of concern undoubtedly and a subject of intense speculation I am sure. Some damn fool thing in the Maldives? 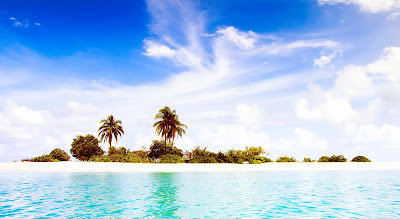 Maldive Islands, Indian Ocean. Action Jackson! Little itty-bitty fly-speck islands in the middle of the Indian Ocean can become a point of contention between two nations each with atomic weaponry? Seems so! Thanks to Russian Times [RT]. "China will 'take action' if India sends troops to crisis-hit Maldives – state media"
"It comes amid a political crisis in the Maldives which began earlier this month, after the Supreme Court threw out the conviction of opposition leader and exiled former President Mohammed Nasheed and ordered that 12 parliamentarians who had been stripped of their seats be reinstated." POLITICAL TURMOIL IN THE MALDIVES WITH THE POSSIBILITY OF INDIAN INTERVENTION AND A RESPONSE FROM CHINA WITH THE DANGER OF CONFRONTATION PERHAPS PROCEEDING WITH THE DANGER OF PUSH TO SHOVE? Seems incredible, doesn't it? Think also "String of Pearls" policy! * "Military Intelligence is an oxymoron." * "Military Intelligence is a contradiction in terms." * "Military Intelligence are two mutually exclusive words." * "Military Intelligence are two terms that do not go together." All the above are true? Such is the public perception? Is it so? Consider the case of Yaakov Armidror. "Yaakov Amidror . . . is a former major general and National Security Advisor of Israel, and was also the head of the Research Department of Israeli military intelligence [AMAN as opposed to Mossad]." "When will the next war begin?" "At one time, military intelligence was responsible for alerting the government to an imminent war. 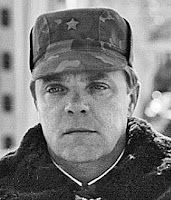 Following the intelligence failure of the 1973 Yom Kippur War, a complex concept called "indicative signs" was developed, the purpose of which is to enable the intelligence collection units to focus their efforts and intelligence research to closely monitor the processes indicative of the concrete preparation for war." Read the whole article for yourself and also decide for yourself if military intelligence is an 'oxymoron", a "contradiction in terms", "two mutually exclusive words: or perhaps "two terms that do not go together". Yaakov his "intelligence" of the highest and most profound nature? When Yaakov speaks we should all listen? Yaakov in retirement from the military but now very active in Israeli politics. That is a common occurrence for Israeli general officer elite when their military career ends. Just one step further in service to their country. Conclusion but perhaps not entirely so? From the South Front channel and thanks to the Ron Unz Internet web site see a video presentation of events as actually occurring in Syrian right now. RUPTLY is an affiliate of Russian Times [RT]? How reliable RUPTLY is I cannot say one way or the other with any degree of veracity. Russian media outlets such as RT, Sputnik, TASS and RUPTLY have an agenda as set by those in high positions in the Kremlin? Whatever the circumstance I recommend highly South Front channel and their video collection. Like I said before, this situation is sticky and can escalate out-of-control in that proverbial heart-beat with consequence of a profound nature not only regional but global in scale. That remains to be seen. We hope for the best as usual but be prepared for the worst. "sticky - - 4. requiring careful treatment; awkwardly difficult"
More on the shoot-down of the Iranian drone intruding into Israeli airspace. Events as followed consider as a warning of things to come. "Shadow War Between Iran And Israel Erupts Into Open Warfare-obliterates Syrian, Iranian targets"
"Israel obliterates Syrian and Iranian targets following brazen UAV intrusion." The plot thickens and the game is afoot as they say. An unfolding even with dire consequences for all if the situation gets out of hand. 1. Iranian drone intrudes into Israeli air space and is shot down. 2. Israeli jets attack the drone control apparatus. 3. Syrian surface-to-air-missiles [SAM] shoot down an Israeli F-16. 4. Israeli Air Force [IAF] in force and with robustness attack a whole series of Syrian military targets. Hardly can any of this said to be over. Updates as they occur. Standby. Flash message. For immediate viewing by all devoted readers to the blog! From the INA and the story by Joel Leyden thanks to the tip from Freeper. "Iran Attacks Israel With Drone, Syria Shoots Down F-16"
"Israel — February 10, 2018 … Iran attacked Israel with an armed drone as it entered the skies over Northern Israel. The Israel Defense Forces responded by shooting the drone down and targeting the Iranian drone control station in Syria. Israeli civilians then came under fire by Syrian and Iranian rockets which resulted in Israel dispatching several fighter jets to destroy the missile and anti-aircraft stations. One Israeli F-16 was shot down over Israel with both pilots ejecting"
This will be a continuous on-going story and we are far from outta the woods yet? GWOT = Global War On Terror. "shoestring - - a small sum of money : capital inadequate or barely adequate to the needs of a transaction started the business on a shoestring"
"Hezbollah and Hamas rank at top of Forbes’ ‘Richest Terror Groups’ list"
RICHES HOWEVER NOT NECESSARILY NEEDED! TERRORISTS OPERATING ON THE PROVERBIAL SHOESTRING CAN ACCOMPLISH EVIL-DEEDS THE COST TO THEM OF WHICH IS A MERE PITTANCE! "On May 1998, a villa in Nairobi was purchased by one of the bombers to enable a bomb to be built in the garage. Sheikh Ahmed Salim Swedan purchased a beige Toyota Dyna truck in Nairobi and a 1987 Nissan Atlas refrigeration truck in Dar es Salaam. Six metal bars were used to form a 'cage' on the back of the Atlas to accommodate the bomb." "In June 1998, KK Mohamed rented House 213 in the Illala district of Dar es Salaam . . . A white Suzuki Samurai was used to haul bomb components hidden in rice sacks, to House 213." "In both Nairobi and Dar es Salaam, Mohammed Odeh supervised construction of two very large, 2,000-pound (900 kg) destructive devices. The Nairobi bomb was made of 400 to 50 500 cylinders of TNT (about the size of drink cans), ammonium nitrate, aluminum powder and detonating cord . . . The Dar es Salaam bomb was of slightly different construction: the TNT was attached to fifteen oxygen tanks and gas canisters, and was surrounded with four bags of ammonium nitrate fertilizer and some sand bags to tamp and direct the blast." "Al Qaeda funded a number of terrorist operations, including the 1998 U.S. embassy bombings in East Africa (which cost approximately $10,000)." Thanks also to the 9/11 Commission report. None of this can be good! American military units in Syria clashing with proxy forces beholden to the Iranian. Proxy forces to INCLUDE PERHAPS RUSSIANS!! And as not reported anywhere else? 1. "US air, artillery strike Hizballah, Iranian forces in E. Syria"
"The US and Russia took military action in the last 48 hours to show the bit-players in the Syrian war . . . that they are not calling the shots for the next moves." . "On Jan. 7-8, members of the US 11th Marine Expeditionary Unit fired M777 Howitzer guns, backed by air strikes, against Hizballah and pro-Iranian Shiite militia forces operating in the Deir ez-Zour region east of the Euphrates River." * "Deir ez-Zour, Here, the US is acting to contain the Syrian, Iranian and Hizballah forces operating in the region from advancing eastward towards the Iraqi border." * "Al-Tanf Front, SE Syria: Hardly a day goes by without Russian special forces, Syrian troops, Hizballah, or local groups battering the US garrison there with artillery fire and air strikes." 2. "Pentagon says US attack in Syria was 'self-defense'"
". . . US forces conducted air and artillery strikes against pro-Syrian forces to repel their attack on a US-backed Syrian Democratic Forces [SDF] base on Wednesday"
3. "More on US strike: Russians who laid Euphrates bridge among targets"
"US F-15 fighters, Apache helicopters, heavy artillery and special forces took part Thursday, Feb. 8 in the early morning attack against pro-Assad, Hizballah and Shiite forces who were crossing the Euphrates to eastern Syria . . . US-led coalition spokesmen estimated that up to 100 Syrian and Hizballah fighters lost their lives in the engagement, possibly including some Russians"
And thank you DEBKAfile. You are up to date and most relevant. And you the devoted reader to the blog are now also! Place this entry in the strange but true category. Billions of English Pounds [£] for chickens but not a penny for defense? "chick·en feed - - noun - - informal - - an insignificant amount of money." "RAF attacking pig, chickens, goats etc?" "MoD [Ministry of Defense] pays millions to farmers for scaring their chickens to death! The Ministry of Defence has been inadvertently contributing money to the UK's farming industry, with figures showing it has paid out nearly £2m [$2.78 million USD] in compensation to farmers in possession of petrified animals. The money has been paid out to managers of stocks of chickens, horses, pigs, sheep and cows who have asked for compensation over their beasts being stressed by low-flying jets and helicopters. 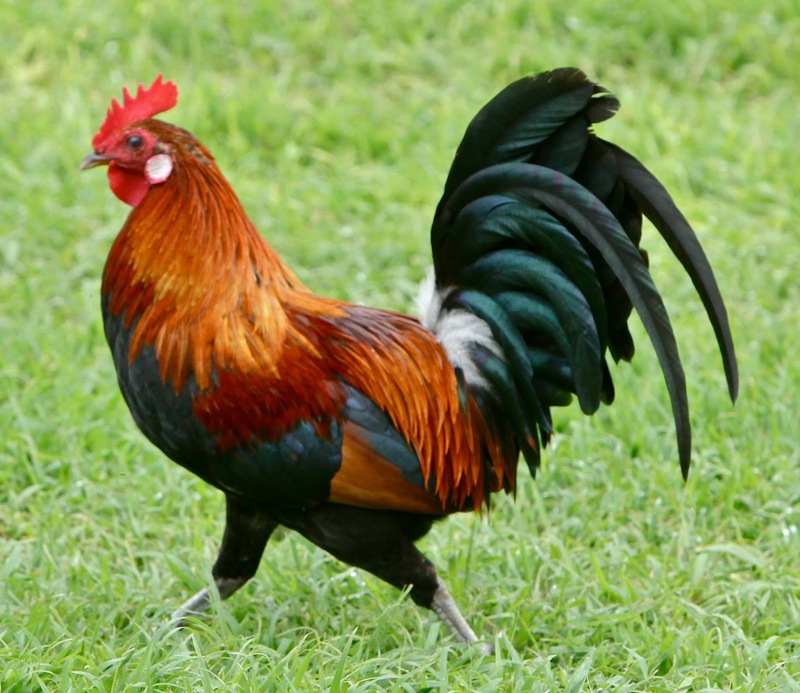 The payouts include 22 made to the nation's poultry farmers who claim their hens have stopped laying after being buzzed by a large metallic bird they interpret as a predator, with a lump sum of £79,041 going to a poultry farm in East Sussex where a Chinook [CH-47] triggered a horrific panic in a bird house that led to the deaths of hundreds of hens. £42,700 was paid to a farmer whose cows literally died from shock after being inadvertently buzzed by a helicopter in Co Tyrone, with a more modest contribution £2,200 going to the owner of a single parrot in Ayrshire that was apparently scared to death by a Hercules [C-130] transport plane." I would say something witty such as those amounts of money no chicken feed but refrain from doing so! An infographic that gets your attention right away. It did for me. "in·fo·graph·ic - - noun - - a visual image such as a chart or diagram used to represent information or data. - - 'a good infographic is worth a thousand words'"
RN = Royal Navy. UK = United Kingdom. A whole variety of sources involved here. Thanks to all and in this particular instance to the Internet web site Zero Hedge. "Visualizing The UK's Shrinking Navy"
Number of full-time enlisted naval personnel in the RN now only three percent [3 %] of what was the amount in 1945. 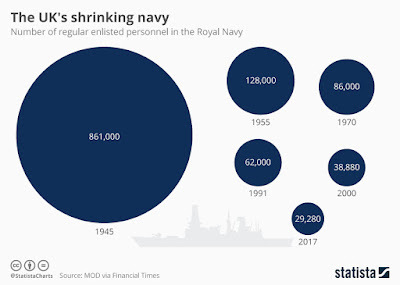 From the end of the Second World War to the present for a variety of reasons the RN has not fared well, total "staff" ever decreasing. Great Britain for centuries and largely in measure to the RN a world power and surly that most preeminent naval power. Those days long gone now and perhaps forever! This infographic also true and with regard to scaling. I have checked for myself. To war with motorcycle, Russian style! "Meanwhile spetsnaz group 2-C-41, of twelve men, has been landed at night near the port of Felisxtone from the catamaran Double Star . . . The group has left the catamaran in the open sea and swum ashore with aqualungs. There it has been met by a spetsnaz agent recruited some years previously He has at the GRU's [Soviet/Russian military intelligence] expense bought a small motorcycle shop, and has always had available at least fifteen Japanese motorcycles all ready for the road . . . The group (containing some the best motorcyclists in the Soviet Union) changes its clothes, it weapons are wrapped in tarpaulin. . . the motorcycle gang then rushes off at a great speed along the A45 in the direction of Mildenhall. Its task is to set up automatic Strela-Blok anti-aircraft missiles in the area of the base and knock out one of the most important American air bases in Europe. 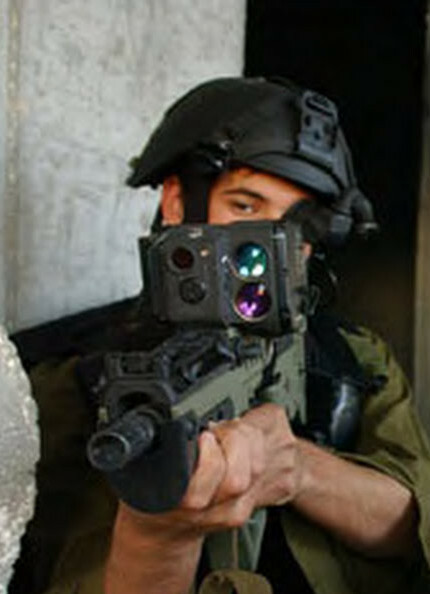 Strela-Blok the pea-shooter infra-red guided shoulder fired surface-air missile existing in an automatic version! AN HOW EXACTLY DO THESE MOTORCYCLISTS BECOME SO HIGHLY QUALIFIED EVEN AT AN EARLY AGE? THINK DOSAAF? SEA, AIR, LAND! AND MOTORCYCLE. 1. Among those para-military DOSAAF sports as listed in the previous blog entry sport motorcycling. DOSAAF participants indulge in sport motorcycling. Here from the Alamy image and thanks to same DOSAAF riders on the ice compete. This is the type of dangerous and rugged winter activity the Russian likes and excels in. 2. 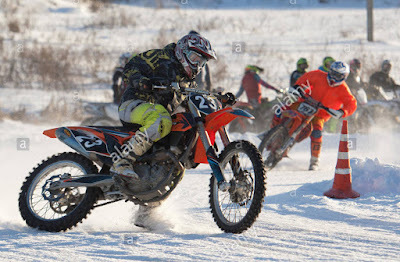 This additional para-military sport as indulged in by Russian DOSAAF enthusiast: Radio Orienteering - ARDF sport. Even now an international event quite popular with practitioners. A combination of radio-electronics knowledge, cross-country running, orienteering [map reading and land navigation] at a competitive level. See the You Tube video regarding this sport. "Radio Orienteering also known as ARDF and 'Radio Foxhunting' is an amazing, adventurous, intellectual and physically demanding sport. The goal is to find hidden transmitters (also called 'foxes') in the forest as fast as possible by using only a direction finding receiver, a map, a compass and orienteering skills. ARDF (Amateur Radio Direction Finding) is a Chess Match on the Run!" A video very well done and with humor. Yes, those competitors are speaking Russian. And the guy gets the girl too! Devoted readers to the blog will be glad to know that I now know how to embed a You Tube video of interest in a blog entry. And we will all be the better for it too! My instantaneous impression was this was like the old DOSAAF of the Soviet era. NO! NOT LIKE DOSAAF. IT IS DOSAAF. "Putin's 'youth army' swells from 40,000 recruits to 190,000 in just one year as Russia continues to strengthen its military ahead of elections next month"
* "Force, consisting mostly of schoolchildren"
* "The 'YunArmia' was created in May 2016"
* "Described as 'military and patriotic'"
"The stated goal of the society was 'patriotic upbringing of the population and preparation of it to the defense of the Motherland'. Among the means to achieve this was the development of paramilitary sports . . . ordinary sports were [are] supported within the framework of DOSAAF facilities: sports halls, stadiums, swimming pools." Mercenaries and foreign interventionists Syria! See previous blog entry as relevant to the topic. Shia as beholden to the Iranian, recruited for the civil war in Syrian. "Where Is Assad Getting His Fighters From? (It's Not Just Lebanon and Iraq)"
That article from The National Interest by Colin P. Clarke and Phillip Smyth and thanks to both. Read the whole article. "In early December, senior Trump administration officials suggested that approximately 80 percent of Syrian leader Bashar al-Assad’s defense against insurgents in the country’s ongoing civil war is being provided by forces imported from outside of the country. The lion’s share of these fighters is being trained and equipped by Iran, the Assad regime’s most ardent supporter." That "lion's share" as described close to 84 %! Outsiders Muslims of the Shia persuasion, outcasts and pariahs to a large extent.in their homelands gainfully employed perhaps even grateful for the opportunity both to make some money and support and die for the faith. First there was Goya. Then there was the Iranian? Came across this quite by accident. 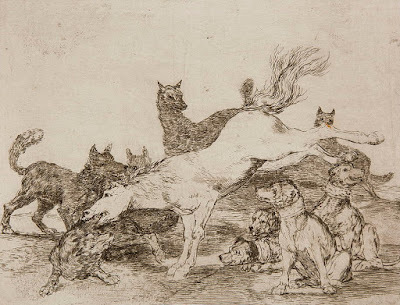 Goya and then Iranian? You the devoted reader to the blog must decide for yourself. War art and art as propaganda. As done by Goya. The horse symbolic of the Spanish nation. Invaded and ripped to pieces by the French army of Napoleon. Dismemberment [dogs or wolves is it?] slow and awful, no respite or surcease. Iranian propaganda art of much more recent vintage. 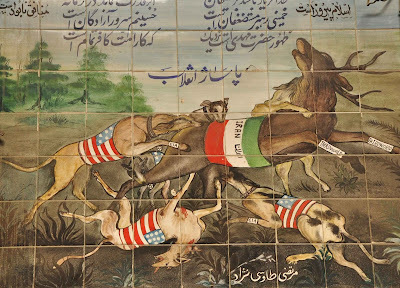 The noble stag as symbolic of the Iranian nation beset by dogs, ripped to pieces. A of struggle good and evil. American canines no mercy for the adversary, attacking the hindquarters and under-belly in a cowardly fashion, perhaps even relishing the task. The dog also in Islamic culture a despised animal, unclean. Images of war as done by Goya an entire portfolio existing. Also see the war art of Otto Dix, as was done during the Great War. Thanks in both instances to the Richard Harris collection. The devoted reader to the blog needs to more than peruse the Richard Harris and the collected works of Goya and Dix as presented. VVS = Russian Air Force. Concluding from the latest edition of the DEBKAfile news letter indications Russian involvement in Syria not coming to and end. Rather the Russian role expanding for a long-term commitment. "Russia is building four new air bases in Syria, deploying another 6,000 troops"
"Contrary to promises, the Russian military is not pulling out of Syria, but adding four more air bases (one shared with Iran) and 6,000 more troops . . . four Syria air bases are being reconstructed and adapted for the use of the Russian air force. The Tiyas Military Airbase (also known as T-4) in the Homs Governorate; Palmyra (or Tadmor) Airport provides air support for operations in eastern Syria including the Deir ez-Zour province (which Moscow has agreed to share with Iran); Hama Military Airport and Shayrat at Homs. 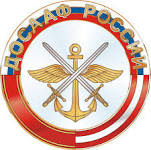 Most of the 6,000 additional Russian military personnel are air force and special operations personnel." Kinda reminds me of Vietnam. We are withdrawing troops so we can reinforce. Machinations of an international geo-political strategy and consideration at work here. FSA = Free Syrian Army. YPG = Kurdish combatants. Once more from an entry at the most latest edition of the DEBKAfile news letter. That Turkish military offensive in the Afrin area of Syria stalled. NO progress. Undoubtedly much to the consternation of President Erdogan. "Erdogan can't deliver on his threats to drive out Syrian Kurdish militia"
"The Turkish army has so far made no progress in capturing Afrin's regional capital or Manbij, despite Turkish President Tayyip Erdogan's almost daily vow to drive the Kurdish YPG militia out northern Syria . . . From day one of the Turkish offensive ten days ago, the Turkish-backed Free Syrian Army, which was trained and prepared to spearhead the operation, was no match for the Kurdish YPG - even with artillery and air support." Turkish trained and supported elements of the Free Syrian Army [FSA] NOW beholden and in debt to the Turk. Puppet troop type duty but as performed very lackluster and without gain! Also this whole mess dissipated and unfocused energy not doing anyone any good! "hegemony - - noun - - leadership or dominance, especially by one country or social group over others"
"Putin plans to end Alawite hegemony in Damascus and evict pro-Iranian Shiite militias including Hizballah"
"DEBKAfile reports that the Russian president Vladimir Putin has prepared a plan for Syria's post-war future for presentation to the Syrian peace conference opening on Jan. 29 at the Black Sea resort of Sochi. Moscow has invited 1,600 Syrian government and opposition participants. Some rebel groups have announced a boycott." * Creation of the New National Syrian Army. Bashar gone? At a minimum. The Alawite [nominally Shia?] comprising only 10 % of the Syrian population but ruling for decades with the proverbial iron fist! "Danon: Iran is running 82,000 fighters in Syria"
"Israel's Ambassador to the United Nations Danny Danon Thursday told the UN Security Council, 'Iran is currently controlling 82 thousand fighters in Syria.' He itemized this figure as 3,000 members of the Iranian Revolutionary Guard, more than 10,000 Hizballah fighters and the remainder Shiite militias sponsored by Tehran. This mixed foreign legion coast Iran around $35 billion. That money was part of the windfall Tehran received for the nuclear deal it concluded with the world powers two years ago and is being spent by Iran to build its biggest military base for the long run." That civil war in Syria characterized by the role of foreign interventionists. The regular military forces of various nation-states and irregular Shia militia fighting on the side of the despot Assad. That preponderance [upwards of 84 %!] of combatants actively aiding and abetting Assad NOT even Syrian nationals. Top-of-the-line found not to be so top-of-the-line!! From the War is Boring and the English Daily Mail tabloid some images with commentary, that Turkish military offensive in Syria the expected results [a quick victory] not even close to being achieved, deficiency [?] of the Leopard 2 main battle tank being made apparent? 1. "Germany’s Leopard 2 Tank Was Considered One of the Best — Until It Went to Syria"
"Cold War tanks encounter 21st century tactics"
"Germany’s Leopard 2 main battle tank has a reputation as one of the finest in the world, competing for that distinction with proven designs such as the American M-1 Abrams and the British Challenger 2. However, that reputation for nigh-invincibility has faced setbacks on Syrian battlefields, and placed Berlin in a uniquely awkward national-level dispute with Turkey, its fellow NATO member." 2. "The £4million German tank dubbed 'one of the best in the world' is shown up in Syria: Leopard 2 bought by Turkey to fight British-backed Kurds has numerous faults exposed in lethal fashion"
"A German-made tank, which Berlin once dubbed one of the best in the world, has had its shortcomings embarrassingly exposed on the battlefield in Syria." MORE THAN ANYTHING ELSE GO TO THE DAILY MAIL WEB SITE AND SEE THE IMAGES OF DESTROYED TURKISH LEOPARD 2 TANKS!! As to: "Cold War tanks encounter 21st century tactics" MORE to follow! From the Russian Times [RT] media outlet an irony as noted but not the full and complete story. "We come in peace, really: ‘Operation Olive Branch’ and other ridiculously named military campaigns"
Turkish Leopard 2 tank with turret facing rearward as part of the most recent Afrin Operation Olive Branch. These are the tanks as the German will no longer provide either a finished unit or spare parts for? Image © Umit Bektas / Reuters. "Since WWI, armies have provided code names for their military operations. Many, however, have been euphemisms to conceal what really stands behind them." An image of heavily a modified American M113 armored personnel carrier? Turks [?] took the basic vehicle as originally designed in the mid-1950's and have created a much more potent infantry fighting vehicle [IFV]. Image © AFP. Within the context of the RT article and least we forget consider that military operation from the era of the Second World War, most appropriately/inappropriately named with regrettable hindsight! OPERATION STALEMATE! "The Battle of Peleliu, codenamed Operation Stalemate II by the United States military, was fought between the U.S. and the Empire of Japan during the Mariana and Palau Campaign of World War II, from September to November 1944, on the island of Peleliu." STALEMATE the landing and capture of Peleliu as planned to last for four days max. Lasted more than four weeks!! STALEMATE became A STALEMATE! ROCK AND CORAL ISLANDS OF THE PACIFIC THAT BEST TERRAIN IN THE WORLD FOR CONDUCTING A DEFENSIVE BATTLE! The devoted reader now has the rest of the story and is more the better for it! Everything now is in a frenzy. Weakness has been found and so must be a remedy! Thanks to Freeper for the tip. "Mattis Reviewing Whether to Ban 'Wide Array' of Devices Like Smart Phones"
"The Defense Department, per direction of Secretary James Mattis, is reviewing whether to ban cell phones or other electronic devices from the Pentagon and other U.S. military installations after reports that apps were revealing sensitive locations of U.S. service members"
THIS IS NOT GOING TO GO OVER WELL. Devices such as smart phones with applications [apps] now an integral and important part of modern life. Almost "lifeblood as they say"! From WIZARD thanks to Harry at Sharkhunters"
"The Australian defense ministry has awarded Lockheed Martin a AU$700 million [$566 million USD] contract to design, build and integrate a combat system for the Royal Australian Navy’s future submarines . 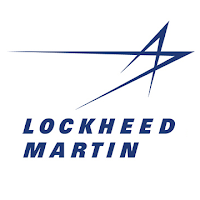 . . the contract with Lockheed Martin Australia would create 200 new jobs, majority of which will be based in South Australia." 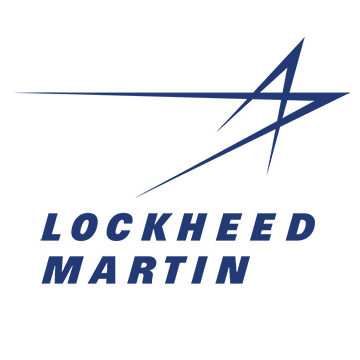 LOCKHEED MARTIN NORMALLY ASSOCIATED WITH COMBAT WARPLANES AND NOT SUBMARINES. BUT SO IT SEEMS NOT TOTALLY SO. "Lockheed Martin Australia was selected as the future submarine combat system integrator in September 2016. A total of 12 Shortfin Barracuda submarines will be built for Australia by French shipbuilder Naval Group at a cost of AUD 50 billion [$40 billion USD]. Construction is expected to start in 2022–23 once 85 per cent of the design work is completed." Submarines as manufactured by the French. This is a Shortfin Barracuda class and not nuclear. My assumption always has been that when you purchase a submarine you buy more or less intact the entire total package. French submarine, French torpedoes, French electronic and electrical systems of all sorts, etc. but this apparently is not so also.